The mitten shell (fig. 1, no. 2) is slip-on style with trigger finger (fig. 1, no. 5). It has an elastic webbing and tape loop for suspension cord at the cuff opening (fig. 1, no. 6) and an adjustable wrist strap (fig. 1, no. 3) and a loop for stowing the trigger finger (fig. 1, no. 4) on the back of the mitten shell. 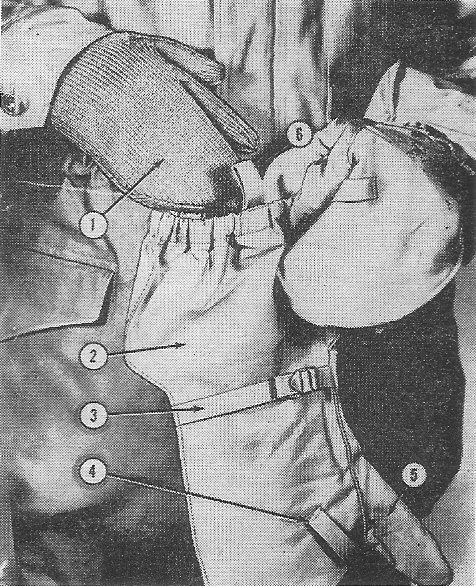 The back of the thumb, hand, and trigger finger down to the cuff of the mitten is lined with insulation for added protection. The leather on the palm is saddle brown deerskin. The fabric on the back of hand, fingers, thumb, and front and back of mitten is wind-resistant, water-repellent cotton and nylon. The insulating material for the back of thumb, hand, and trigger finger, down to the cuff of the mitten, is polyester batting.